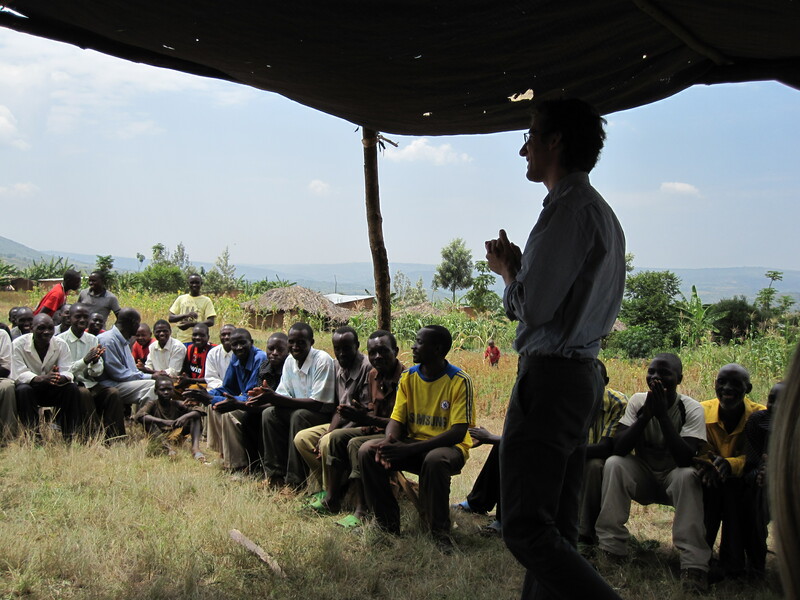 Went for a heroes day celebration in one of the umudugudus (communities) with the district secretary Hubert. 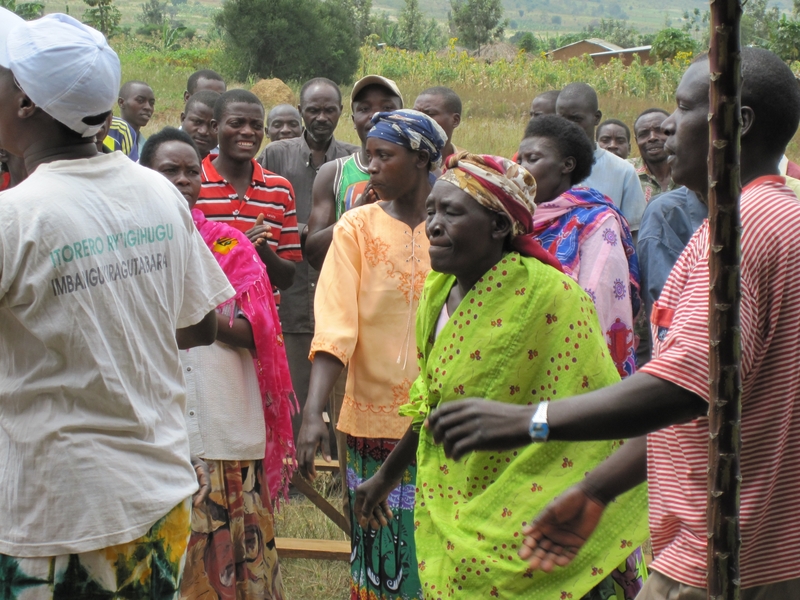 This is a day when Rwandans come together to celebrate unity after the genocide and to celebrate their heroes. These heroes are the liberators and also the Rwandans who refused to take part in the genocide and were killed. Everyone was dressed in their finest and they sang many patriotic and political songs praising President Kagame for bringing the country together. There were many speeches by the mayors of the villages, the city council and government officials. There was a great deal of joyous dancing and singing. The dances reminded me of Rwanda’s iteration of step dancing. There was even a drummer and a lot of hand clapping. Many brightly colored umbrellas and the women in their finest clothes. Broke for lunch and met more of Partners in Health incredible staff. A lovely young woman called Catherine who was orphaned in the genocide has been adopted by one of the doctors here and has applied to Deerfield for a scholarship. She is a survivor of cancer – a serious young woman, a great student who wants to be a doctor. I believe the students at Deerfield would greatly benefit from her participation. Another home visit to a family of four orphaned by the Aids epidemic, they were refugees returning from Uganda after the genocide. Two older children in boarding school, two younger in an orphanage and the fourteen year old was living on his own and walking to school everyday for 30 minutes. His neighbor keeps an eye out for him. PIH has changed their lives in so many ways. The social worker has used a classic holistic casework model looking and advocating for services such as health, housing and other essential schooling. Finished our day at a soccer game where the cows graze. My companions brought 20 or 30 new soccer balls – delighted children and another ceremony to thank us. Again another great collaboration between PIH and the local recreational services as well as volunteer coaches and referees. Looking out over the beautiful valleys, mountains and lake, listening to the birds as the sun sets and evening moves in with a warm breeze at its edge, its difficult to believe people were killed on this spot. It was a soccer stadium where Rwandans came to escape the terrible inhumanity of senseless violence without success. 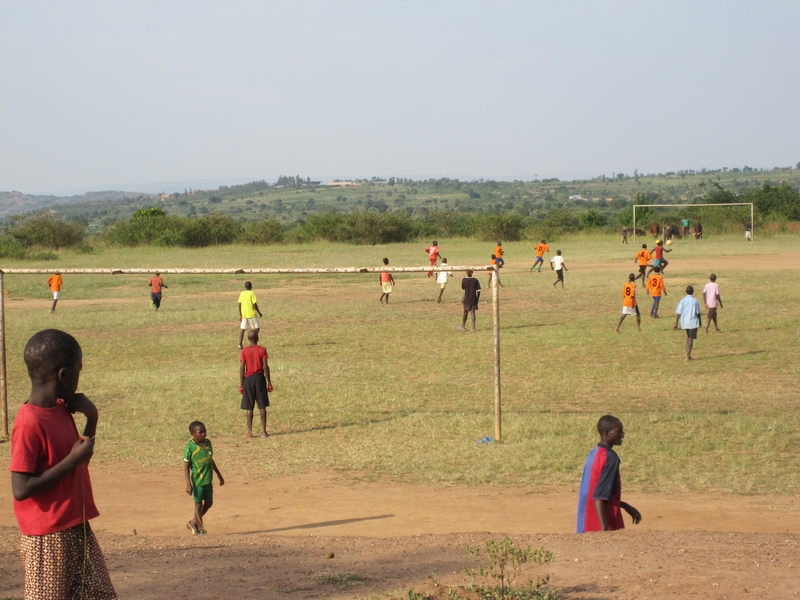 Its memories are haunting, and yet in juxtaposition, the energy and vitality of the young children playing soccer in this very spot leave us with much hope for reconciliation and for the future of this inspiring country and its people. We visited Butaro Hospital another PIH project. Working with the government they are constructing Africa’s state of the art hospital. 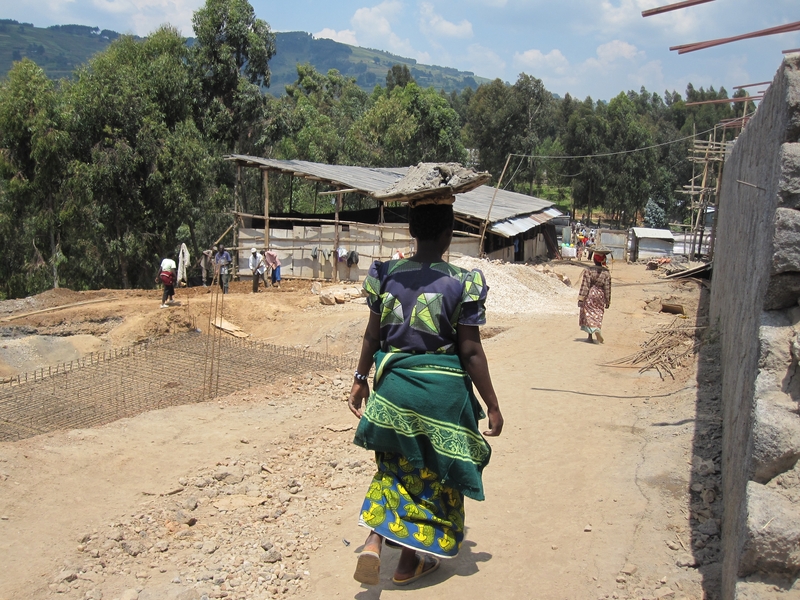 It is being designed by one of PIH’s Rwandan consultants who oversees all of their building projects called Bruce. Working in conjunction with a young architect from the US they are building the concrete bricks with all local materials. There is a great deal of beautiful stonework. Two or three magnificent trees have been left at the sight which will give the inner courtyard a peaceful feeling for patients who will walk and recover there. I’ve already decided that if I get sick this is where I want to be. Located at the top of a hill where chiefs met for centuries surrounded by a ring of trees, later turned into an army post in the genocide occupied by both sides, then by the government to bring justice to the perpetrators of violence and now a space that will give life and humanity another chance. The hospital has been designed to take advantage of the beautiful views that look out over mountains, lakes and valleys. Bruce has found a design that allows every bed to look out on this peaceful and beautiful place. I think we in the US could learn a lot about how nature can work with the human spirit to heal. So many wonderful young people volunteering here with great stories. Their passion and conviction to eradicate world poverty is incredibly moving. Their skill level is remarkable. PIH is like a magnet for our future as a compassionate and caring world and here with these young leaders that is looking increasingly bright to me. The family we met today was in the POSER program. 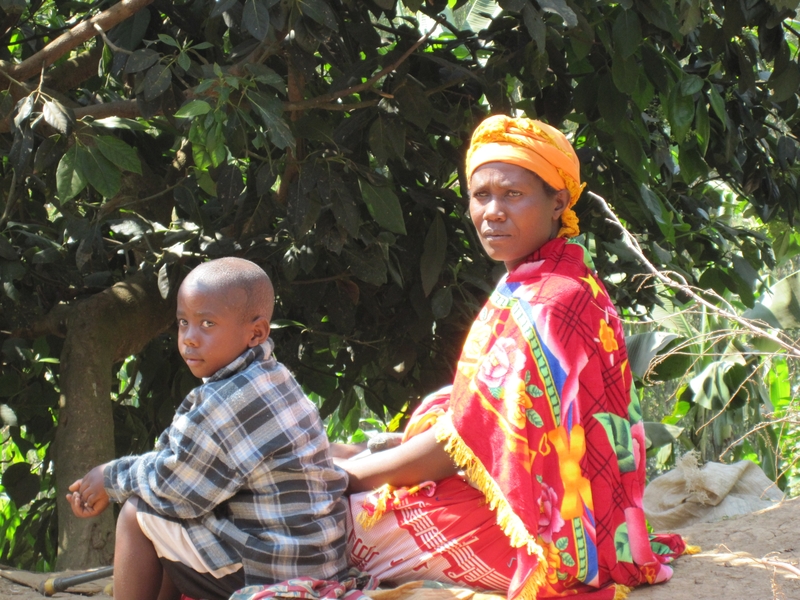 A crippled mother and a son of about ten who supports the family by making mud bricks. He has successfully built a small chicken house and they have two sheep. The same poverty I have experienced worldwide, including the US, just with a different face. Yes Paul Farmer is right poverty with any face is obscene. An extremely bumpy ride on dusty red roads with breathtaking views of the volcanoes and lakes. This is an extraordinarily beautiful country. I am now sitting on the balcony of my stone cabin with tile roof and wooden floors at the Volcanoes Virunga Lodge looking out on five beautiful volcanoes as the sun sets. I can hear the voices of children playing and sheep bleeting. 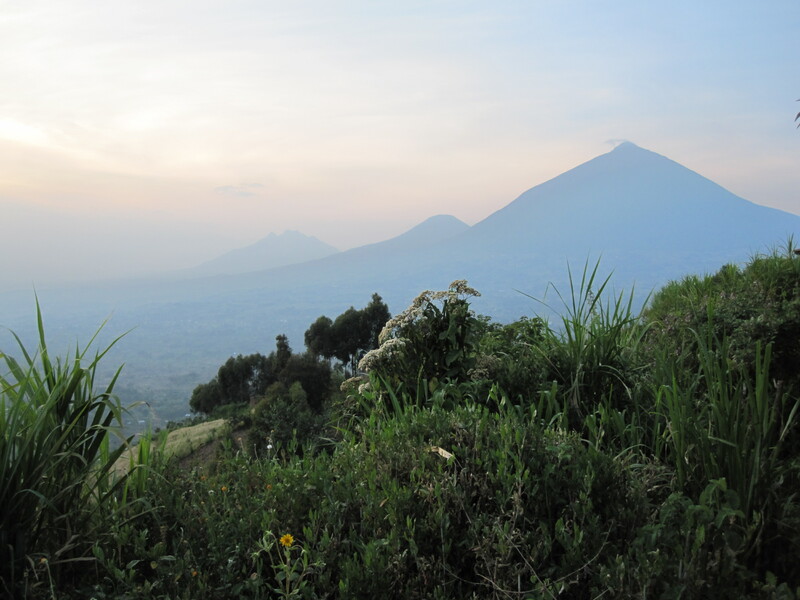 Right next to me the crickets chirp and sing as evening falls on the Virunga Volcanoes Mountain Gahinga and Bwindi and Lake Ruhondo and Bulera surrounded by peaceful and relaxing gardens and landscaped stonework. A sunset of orange and purple wreathed in grey clouds. Tomorrow we go and search for gorillas and I can’t wait. The bathrooms here are wonderful – canvas bags filled with hot water all ecologically sound and slowly being replaced by solar. This trip has made me feel lucky for what I have, and while I sit here and enjoy this peace and quiet I think of all the obscenely poor families I saw, all of whom I will never forget. 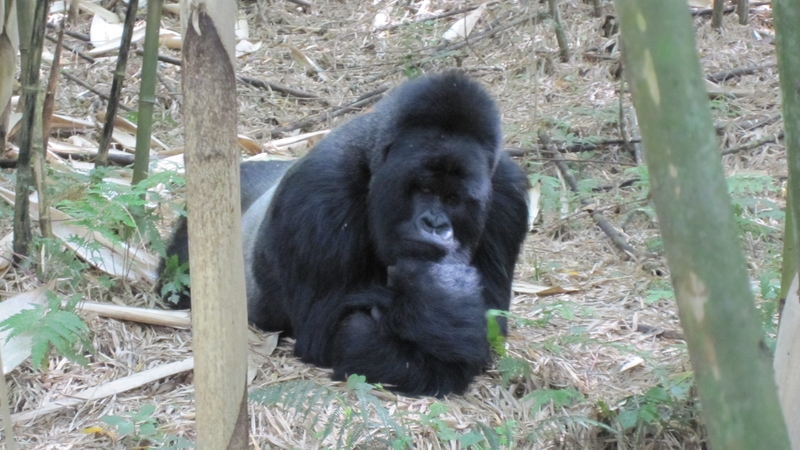 Today we went to visit the mountain gorillas in Parc National des Volcans. We climbed the old man’s teeth volcano (Mount Kyambura). Quite a hike up to the forest and then through bamboo groves with extraordinarily accomplished guides and trackers. We came upon a huge silver back, head of the Hirwa Group (Lucky) who showed off for us all. This group is called lucky because the big silver back stole his seven or so wives from other groups! The guides told us that he was showing off and posing because we were a group of ten women of different ages and nationalities. The silver back kept rushing by us and striking Rodin like poses for us. It was actually quite exhilarating at one point he was not an inch away from my back which was scary and amazing at the same time. He also lent out as he passed by and swatted at our guide on the arm – apparently he was angry because he kept calling his wives to show them off to us and they wouldn’t come, they remained in the treetops eating! 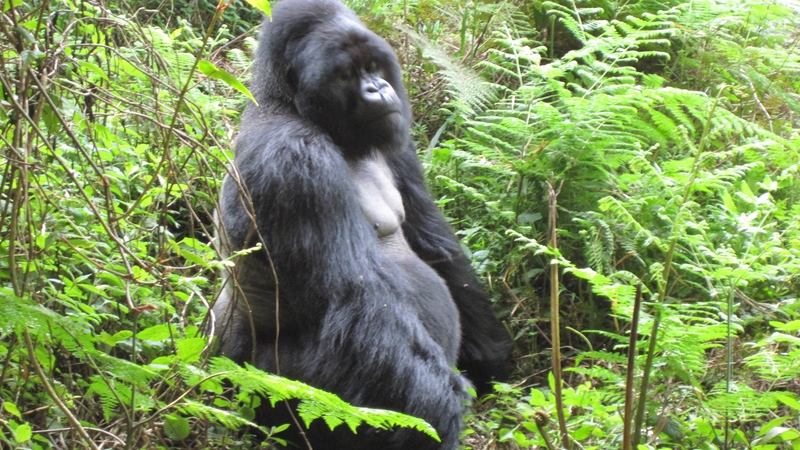 These mountain gorillas are magnificent and Rwanda has done a marvelous job of protecting them from poachers. The mountain we climbed Mt. Kyambura had a side in Rwanda, a side in the Democratic Republic or Congo and a side in Uganda! We could see all three countries as we climbed! After an hour with the big silver back, two beautiful baby gorillas and a wife who appeared at the top of the tree munching bamboo we went back down to the lodge and got our certificates certifying we had indeed seen the famous mountain gorillas.